No game today, so the focus is on the other aspect of the trip – travel (sort of). I went to the Henry Ford Museum here in Detroit, prepared, in my ignorance, to sniff haughtily at the industrialist’s self-aggrandizing tribute, but came away impressed. Ford was a complicated man – not all of the complications are on display, but many of the interests are. For example, he had quite a furniture collection. It is not all there, but forms a link in the story told, going much further back and also forward to the present showing how various types of furniture evolved. There are many agricultural machines, trains, airplanes and, of course, cars. Most surprisingly, there is a fairly comprehensive exhibit devoted to the history of the civil rights struggle – both racial and gender. Most interesting to me was a wide ranging presentation of the industrial revolution in its myriad aspects, including a variety of engines of all sizes and applications. It is well worth visiting. OK, you knew I couldn’t leave baseball alone. Here are a couple of pictures of players wearing stirrups (Steve Cishek on the left and Francisco Lindor on the right). They cover the calf but have just a loop under the instep. These are fairly rare in the big leagues these days, but not so long ago, they were the only style used. The origin isn’t entirely clear, but no doubt started because players originally wore knickerbockers that stopped at the knee. Some say that the outer socks were wool and “not healthy” so the white “sanitaries” worn beneath protected the players from the colored socks that often gave the teams their names (Red Stockings, Red Sox, White Sox, etc.). More likely, it was the combination of the itchy wool and bleeding color that made the sanitaries necessary. Nowadays, the overwhelming style is long pants that come to (and often below) the shoe tops so that no socks are visible at all. It’s also time for an argument. One of the questions in the new interactive display at the Hall of Fame is whether the National League should adopt the designated hitter like the American League did some forty years ago. Purists say that having pitchers hit makes the National League more strategic, others argue that the DH provides more offense and that fans don’t want to watch pitchers embarrass themselves with their pathetic swings. But the interesting subargument (to me) on this issue is whether a player who has spent most of his career as a DH should be admitted to the Hall of Fame. None has to date, but this is David Ortiz’ last year playing and I see little chance that he won’t be voted in. So why isn’t Edgar Martinez getting more votes (he’s never received more than 45%)? His numbers are comparable to Ortiz’, but he played in Seattle and wasn’t as showy as Big Papi. 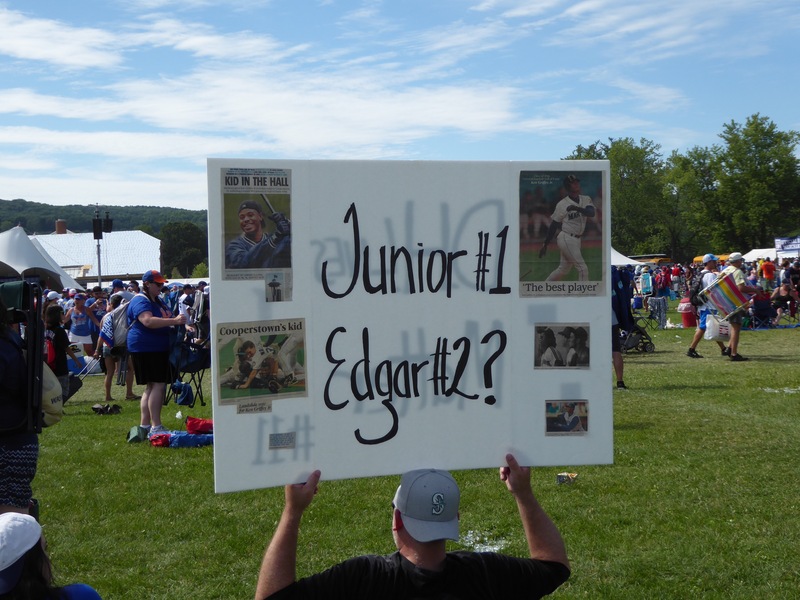 The argument was evident in Cooperstown. I think Edgar goes in. Oh yes, and the best baseball license plate so far (in Ohio) – BOO NYY. I’m commenting on August 1 and in light of the unbelievable loss to the Cubbies last night I think Cishek should consider changing his socks at the very least, maybe his number, his toothpaste, and the spelling of his name. You couldn’t make up a game like last night. Henry Ford museum a very interesting stop but I’m still trying to figure out his connection to race and gender equity. I know he was a horrible anti-Semite but maybe he liked everyone else?